If you are a solopreneur, you know you do it. The “occasional” Facebook check in or the constant email barrage turns into a lost 15 minute, half hour or longer. Twitter? Fuggetaboutit. The amount of distractions, time-wasters and actual productivity loss by being the chief cook and bottle washer is worse than you think…much worse. While I have my share of productive days and “off” days, I recently was challenged by my coach to keep track of my entire week in 15 minute increments. While I was able to schedule a few new client meetings, and update the progress on 4 separate projects, the total amount of time invested to productive output (Time ROI) was dismal. I knew I have a bit of ADD, but shining the light on it was horrifying. The productivity gains in the FIRST DAY resulted in one new client and 3 new leads that I otherwise may have missed. In my world of high-ticket ghostwriting, marketing and publishing this is a massive ROI. I will add a new blog about productivity in the coming weeks, but in the meantime, if you want to create an extra hour or two a day, forget making lists and checking them twice. With the Action Time Machine, you have a tool that leads, not follows your day. The bonuses are clear and high value also. I’ve printed up a few and will post them here after the holidays. MY bonuses will (said as humbly as possible) overshadow the author’s. Not because what I have to offer is 10X better than the creator of the Action Time Machine, of course. Your productivity gains could easily exceed my bonuses. But, if you are an entrepreneur, you’ll certainly use at least 2 out of my 3 bonuses, easily worth $500+. 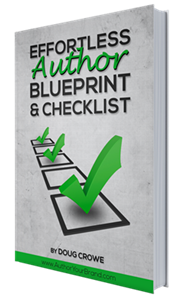 One FREE 30-minute consult on crafting, writing and publishing your own book. One FREE $200 Press Release on Newswire, a Google Certified news agency. If you are like me, you will instantly see the brilliance of this system and easily be insanely more productive, pick up new business and even ‘create’ a few extra hours every day. Just drop me an email to doug at dougcrowe dot com and I’ll get you set up.